Finschhafen is a town 80 kilometers east of Lae on the Huon Peninsula in Morobe Province of Papua New Guinea. The town is commonly misspelt as Finschafen or Finschaven. During World War II, the town was also referred to as Fitch Haven in the logs of some U.S. Navy men. The area was charted by the British navigator Captain John Moresby in 1873–74. Finschhafen was surveyed in 1884 by the German scientist and explorer Otto Finsch who gave his name to the town. A town was built in 1885 as part of the colony of German New Guinea and was named after the discoverer (-hafen = -harbor). In 1886, Johann Flierl and two other Lutheran missionaries settled in the area, creating a Mission station at Simbang. A malaria epidemic in 1891 caused the town to be abandoned by the German plantation owners and government officials. It was resettled afterward and was claimed by the Germans in 1894. It was finally abandoned in 1901. Finschhafen was occupied by the Imperial Japanese Army on 10 March 1942 during World War II. Australian forces recaptured the town during the Huon Peninsula campaign on 2 October 1943. 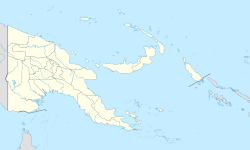 On 2 February 2012, the passenger boat MV Rabaul Queen, which had 350 or more passengers on board, sank nine miles away from the town, killing six people, injuring seven, and leaving at least 100 but possibly over 300 missing. ^ Ensign N. T. Shows, Jr. "World War II Journal of Ensign N. T. Shows, Jr". Magnolia Manor Genealogy. Retrieved 4 January 2014. ^ a b c "Finschhafen". Encyclopædia Britannica. Retrieved 10 July 2010. ^ Updated at 10:23 pm on 5 February 2012 (5 February 2012). "Radio New Zealand : News : World : Official death toll in PNG ferry sinking climbs to 6". Radionz.co.nz. Retrieved 25 April 2012. ^ Vancouver Sun 3 February 2012 (3 February 2012). "100 feared dead as storm swamps ferry". The Vancouver Sun. Retrieved 25 April 2012. ^ Updated at 1:45 pm on 11 February 2012 (11 February 2012). "Radio New Zealand : News : World : 300 now feared dead in PNG ferry sinking". Radionz.co.nz. Retrieved 25 April 2012.